8 Detachable Sections: Portable for children, easy to assemble/storage and convenient to take it everywhere. Vibrant Colors: nice looking, nearly all kids love colorful things, It is a nice gift to 3-8 years old Child. Add the weight as you wish: if you think this hula hoop is a little lightweight, you can fill some sand / rice / beans or somthing else like this in the hula hoop, then it turns to a weighted hula hoop. Hula hoop's benifit: Improve balance and flexibility as well as Coordination, Enhance Cardiovascular Fitness, Practice Dancing etc. DO NOT PUT IT NEAR THE FIRE! ❤ SPECIAL DESIGN HULA HOOP JUST FOR CHILDREN: ebelken's hula hoop made by Environmental protection non-toxic engineering plastics (ABS), it is not only abrasion resistant ❤ Tips: as this hula hoop is designed for children, so this hula hoop's ABS plastic is not as hard as adults' hula hoop plastic, as we all know, it will hurt the kids if it's too hard. If the hula hoop split when you assemble it, don't worry, just contact us and we'd like to resend you a new one instead. 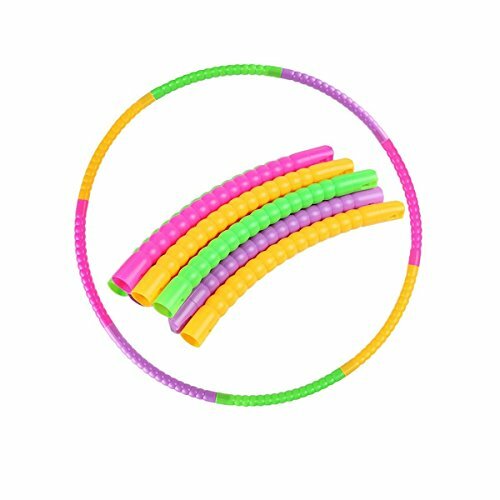 8 DETACHABLE SEGMENTS: you can use all 8 segments to assemble a 60cm-diameter hula hoop; and use 7 segments to asseble a 55cm-diameter hula hoop, and so on. Kids can adjust the hula hoop to their own size. The colors are vibrant, children will love it. It is a nice gift to 3-8 years old Child. ADD THE WEIGHT OF THis HULA HOOP AS YOU WISH: if you think this hula hoop is a little lightweight, you can fill some sand / rice / beans or somthing else like this in the hula hoop, then it turns to a weighted hula hoop. SNAP TOGETHER DESIGN: the snap button connectors will not break or fall apart easily. Also it is weather proof. Besides, as to the small size, it's easy to carry to anywhere, convenient to exercise anytime. HULA HOOP IS GOOD FOR CHILDREN: Improve balance and flexibility as well as Coordination, Enhance Cardiovascular Fitness, Practice Dancing etc. eBelken always offer friendly after-sales service to all our customers. If you have any questions about this product by eBelken, contact us by completing and submitting the form below. If you are looking for a specif part number, please include it with your message.